As with any island, Nantucket has witnessed all sorts of changes over the winter. Shops, restaurants, and other businesses have shuttered, while others have sprung up or been refurbished, offering islanders and visitors a roster of fresh places to discover. With the summer season in full swing, here’s what’s new. After being boarded up for six years, The Dreamland Theater (17 South Water St., 508-228-5356) has reopened to movie lovers and performers after a more than $30 million renovation that includes a 320-seat movie theater, second-floor studio theater, and outdoor community space. Originally built in the 1830s as a Quaker Meetinghouse, the building subsequently became a straw-hat factory, roller-skating rink, and then the center portion of The Nantucket hotel. In 1905, a group of islanders purchased the building and it was floated across the harbor to its present location. Over the years it showed moving pictures (silent and then talkies), vaudeville shows, and then movies, with the upstairs portion serving as a dancehall. In 2004 financial troubles caused the theater to close. It languished until 2007 when the Nantucket Dreamland Foundation formed to save it. “In the rebirth of this theater we’ve taken something that was a summer-only theater and remade it, using some of its own historic fabric, into a state-of-the-art facility that will serve the island year round and digitally connect us with programming far beyond our shores,” says Wendy Schmidt, president of the foundation’s board. Sea Dog Brew Pub & Restaurant, Nantucket. The island has new spots where you can sip, sup, and chill out, beginning with Cru (1 Straight Wharf, 508-228-9278), a waterfront eatery where seafood reigns supreme for lunch, dinner, and weekend brunch. In addition to over a dozen varieties of oysters, the menu highlights local catches. Two bars offer an extensive roster of champagnes, wines, and cocktails. Toward the center of town lies MET on Main, (38 Main St., 508-325-5111), the fifth establishment in the Boston-based Metropolitan Club restaurant group. Serving breakfast, lunch, and dinner with Asian, Mexican, and Polynesian accents, it has such creative offerings as a pancake bar, raw bar, and tartar bar. More globally inspired fare abounds at Fog Island Grille (5 Amelia Drive, 508-228-1879), a sister restaurant to the in-town Fog Island Cafe. Open for dinner only, Fog Island Grille serves items like Mexican-style tortilla soup, burgers, and mains. For Asian food, the Thai House (118 Old South Road, 508-680-1522) satisfies yens for curries and pad Thai, while offering sushi and Chinese favorites such as General Tao’s chicken. 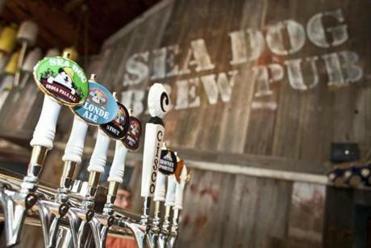 At Sea Dog Nantucket (15 South Water St., 508-228-8011), the fourth incarnation of the original Maine brew pub, craft beers from the Maine brewery flow, along with those from Nantucket’s Cisco Brewers. The pub also serve cocktails and casual grub. Monelle (Zero Candle Street, located inside the 1 Main Street building, 508-901-5561) has hip women’s wear, while Dakota (23 Old South Wharf, 508-901-5332) sports splashy frocks, along with jewelry, cufflinks, and more. With biking, walking, sailing, tennis, golf, and surfing, Nantucket offers a bevy of outdoor activities. New this year is disc golf. Open to the public and free of charge, the nonprofit, eight-hole Nantucket Disc Golf in the Nantucket State Forest South Pasture off Old South Road calls for using a plastic disc — instead of golf club and balls — to sink in large baskets, instead of small grass holes. While you bring your own disc, game instructions and rules, maps of the course, and directions are available at www.nantucketdiscgolf.org. From July 26-28 the island will host the first annual Nantucket Yoga Festival at Bartlett’s Ocean View Farm (33 Bartlett Farm Road, 508-228-9403). Throughout the day on Friday and Saturday paying participants will be able to attend various classes, workshops, and lectures taught by over a dozen internationally acclaimed teachers. The festival will include a vendor village open to the public featuring artisans, jewelry makers, and clothing designers. For more information go to www.nantucketyogafestival.com. Victoria Abbott Riccardi can be reached at variccardi@rcn.com.